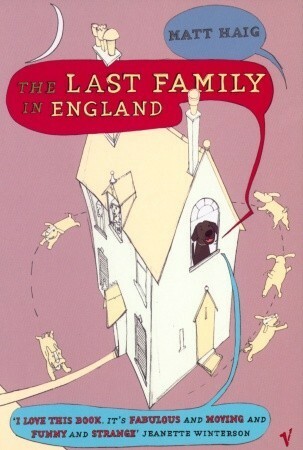 If you have ever own a dog…or a cat…then The Last Family in England by Matt Haig might be of interest to you. The story is told from the dog’s point of view and the view point is so convincing, I found myself looking at my pets and wondering if they were thinking the things Prince, from the book, was thinking. And, I almost convinced myself that they were! The book covers a wide range of topics; some of which are quite embarrassing so I won’t even attempt to go into those here. But the safer ones include adultery, suicide, growing up and disjointed family life. At first, I found the book hard to get into, but that was nothing to do with the writing or the subject matter. It was because this is the first book I’ve attempted to read in months. Before long, I found myself gasping with shock at the embarrassing parts, empathising with the characters in other parts of the story and snickering at Prince’s thought patterns. Not to mention getting choked up and crying. Any book that brings out that emotion must get brownie points, in my opinion. I picked up this book completely on a friend’s recommendation and I had no idea what the story was about and I didn’t read the blurb on the back cover. In other words, I had no expectations and I found the story to be completely different to anything I’ve read in the last decade or more. Even with the rude bits…and the swearing, it was refreshing and interesting. For those of you who know me well, you’ll know that’s unusual for me. I’m usually quite straight laced. Anyway, the characters are human (except for the dogs in the story, of course), the problems are real and the emotions strong. I recommend this book if you’re looking for something different. Ah. Adultery and suicide are the cleanest topics in this book? Sounds…unique. Hey Karen, I’m glad you enjoyed it. You said you wanted something different, which is why I recommended this particular book. You are a straightlaced soul – I don’t remember the book being shocking or outrageous at all. It’s just human (and canine). Then again, I’ve had people tell me that my writing is like a cross between Neil Gaiman and Quentin Tarantino, so I suppose I’m not the best barometre of clean, family fun!